Good guys don’t always win, but one good guy is about to do so for the 500th time. 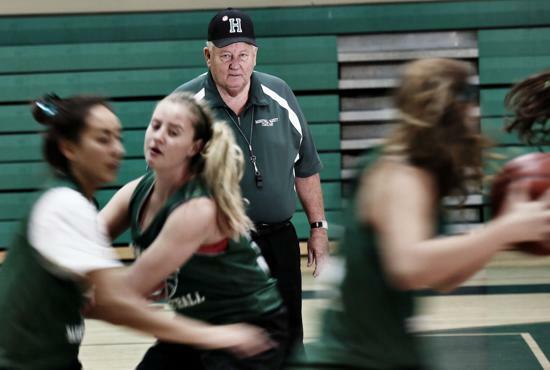 Despite never being blessed with a pipeline of talent, Hilltop High’s Coach Ray Jindra entered the 2012-2013 season with 497 victories, ensuring his place among the county’s elite girls basketball coaches. It all got started when Jindra, a 1962 Hilltop graduate, went from coaching a successful South County church league team to answering a call for help for a struggling Sweetwater High School squad. Always a walk-on coach, Jindra bounced around coaching girls or boys at either the varsity or JV level. Stops included Sweetwater, Marian Catholic, El Cajon, Southwest and finally his alma mater. During his 15 years at Southwest High he was provided with one of his favorite stories, on multiple levels. First there was the seeding meeting. The respect showed Jindra’s team at the seeding meeting was quickly erased by the treatment he felt they got at Helix. After winning back-to-back league titles with the Raiders in 2002 and 2003, Jindra walked into the principal’s office and revealed he was ready to retire. They agreed to keep the discussion quiet. While very few of Jindra’s teams have made it past the first round or two of the playoffs, even top teams dread playing them. Jindra wasn’t even afraid to rally his squad from 21 points down by emptying his bench and giving fouls against a better, but poor free-throw shooting opponent. It’s never been all about wins for Jindra. Hilltop has two victories so far this season, and Jindra’s next chance for the landmark win is Friday.